Two of President Trump's business advisory councils imploded on Wednesday as CEOs resigned over his response to violent white nationalist rallies in Charlottesville. But another White House initiative, The American Technology Council, remains intact. The tech panel is made up of government employees and has no members from private industry. A White House official said Wednesday that the American Technology Council will go "full steam ahead on its work." Some prominent executives, 18 to be exact, attended a summit hosted by the tech council in June. They included Amazon's (AMZN) Jeff Bezos, Apple's (AAPL) Tim Cook and Microsoft's (MSFT) Satya Nadella. Currently, no in-person summits or meetings with corporate executives are scheduled, the White House official said. But the council may choose to reach out for advice or assistance on specific issues -- such as beefing up the federal government's cybersecurity. "The council will continue to occasionally consult with the private sector on specific issue areas," the official said. But Rashad Robinson -- the executive director of racial equality group Color for Change -- said he doesn't want tech companies to answer those calls. Color for Change was part of an online effort to encourage CEOs to part ways with Trump after Charlottesville. 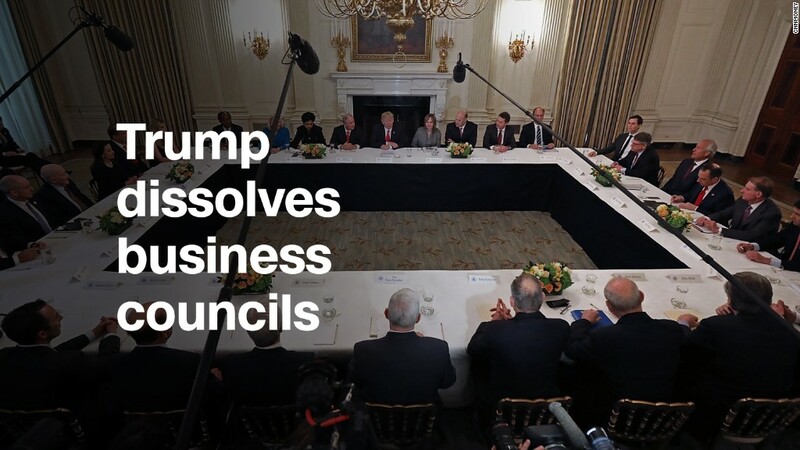 Two councils -- a manufacturing council and an economic policy forum -- were dissolved on Wednesday as business leaders rushed to distance themselves from the president. Robinson called that a victory. Robinson told CNNMoney his group is "increasingly concerned about tech companies," because extremist groups can use the internet to spread their hateful ideology. He wants tech CEOs to make it clear they will not engage with the American Technology Council in the future. CNNMoney reached out to the companies that sent representatives to the June technology summit. Only one, Akamai, a cloud delivery platform, confirmed it will continue to work with the White House's tech initiative, but said it has "no tolerance for racism, hatred or bigotry." Several other companies declined to comment on their plans. The rest did not return a request for comment. A few tech CEOs that attended the June meeting have spoken out publicly against bigotry. Apple's Tim Cook called on all Americans to "stand against" the "terror of white supremacy." But Apple declined to comment on whether the company would engage with the tech council if called on. Intel CEO Brian Krzanich -- who rescinded his membership in the Manufacturing Jobs Initiative in response to Charlottesville -- called on the administration to "set scoring political points aside and focus on what is best for the nation as a whole." It wasn't clear if he intended to work with the tech council in the future. Intel (INTC) did not immediately respond to comment. The tech council was created via an executive order in May to give "advice to the president related to [tech] policy decisions." --CNNMoney's Jill Disis and Noah Gray contributed to this report.